Octocorals are sessile animals with a mobile larval phase that are only found in marine systems. Octocor-allia are a subclass within the Class Anthozoa. The distinguishing characteristic of this subclass is that their polyps always bear eight tentacles (hence octo-coral), which are fringed by one or more rows of pinnules along both edges (Fig. 21.1). The popular term 'soft coral' points to the fact that most octocorals, in contrast to the related hard corals, have no massive solid skeleton. Instead, their colonies are supported by tiny calcareous granules called sclerites, which in most cases are separately embedded in the tissue and further supported either by a hydroskeleton or a proteinaceous or calcareous axis, or, in a few cases, by sclerite fusion into a solid structure. The terminology used in the literature to refer to oc-tocorals can initially be confusing. The term 'soft coral' is commonly used to refer only to those octocorals that have no massive skeleton or internal axis, but sometimes it also includes the sea fans, and occasionally it is used to refer to all Octocorallia. The term 'gorgonian' is most conveniently used when referring to octocorals (other than sea pens and blue coral) that arise from the substrate with the support of an internal axis. The term 'sea fan' is often used synonymously with the term gor-gonian, however, some people use the term sea fan exclusively for gorgonians with a fan-shaped morphology. Taxonomically, there is no distinct morphological dividing line between soft corals and gorgonians, although the terms are useful to retain. Earlier separations into different groups have now been abandoned, because continua of intermediate forms exist. They are therefore now all included under the one scientific category—the Order Alcyonacea. Recent phylogenetic research suggests that further significant changes to the current family level classification are likely to occur in the next decade. Octocorals are a diverse group of reef inhabiting organisms on Indo-Pacific coral reefs. 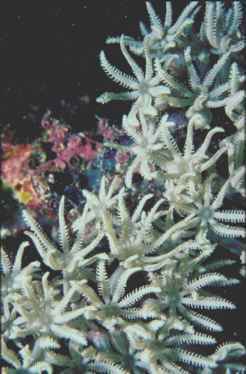 There are three scientific orders in the Subclass Octocorallia: first, the Order Alcyonacea, which contains all species commonly known as soft corals and sea fans; second, the Order Helioporacea, (blue coral), and third, the Order Pennatulacea (sea pens). By far the greatest majority of octocorals found on the Great Barrier Reef (GBR) belong to the Order Alcyonacea (the true 'soft corals' and 'gorgonians'). Within this order, about 100 genera in 23 families have been described from shallow waters of the Indo-Pacific to date. In comparison, the Pennatula-cea (sea pens) and Helioporacea (blue coral) play a minor role in the octocoral fauna of shallow coral reefs. In sea pens, nine genera in five families are presently known from shallow waters of the tropical and subtropical Indo-Pacific, where they tend to live in soft bottom habitats often only emerging at night. The blue coral is represented by a single species in the Indo-Pacific. Relatively few detailed octocoral studies exist (e.g. from the GBR and other parts of Australia, New Guinea, New Caledonia, Micronesia, Japan, southeastern Africa and the Red Sea), and there are still major gaps in the understanding of octocoral biogeography. Furthermore, the number of shallow water Indo-Pacific octocoral species is unknown, as many species still await taxonomic description and many genera are in urgent need for revision. The only systematic taxo-nomic inventory of Indo-Pacific coral reefs is from Palau in Micronesia, where 150 species have been recorded. On the GBR, the species number might be similar, but verification of such an estimate will remain impossible until taxonomic research advances. Octocorals of the GBR include a diverse range of species with widely contrasting biological properties and ecological requirements. While many species appear to be quite long-lived and slow-growing, some octocoral species (especially among the family Xeniidae) are fast colonisers with a short life expectancy. Some large Sinularia colonies (family Alcyoniidae) are probably hundreds of years old, and some of the large gorgonian colonies may also be many decades old. Life expectancy and growth rates of most soft corals and gorgoni-ans are largely unknown, but many of them appear to be quite slow-growing, extending by only one to a few centimetres per year. Octocoral colonies also commonly shrink, for example, when torn by storm waves or damaged by moving rubble or predation; as in other modular organisms there is therefore only a weak relationship between size and age. Dispersal strategies also vary greatly among species, and include asexual propagation and sexual reproduction. Rapid colonisation of small patches of substratum often includes the asexual generation of daughter colonies at the terminal ends of stolons ('runners') formed by the mother colony. Other forms of asexual propagation involve budding of miniature colonies that fall off the mother colony and settle nearby, and fragmentation, when a middle part of a colony dies yet the edges survive and reorganise into complete colonies. Larger patches of bare substratum tend to be colonised by the settlement of pelagic larvae, the product of sexual reproduction. Some octocoral species are gonochoric, that is, males and females are separate colonies, while other species are hermaphroditic, with all mature colonies producing both male and female gametes. Two modes of sexual reproduction exist: first, 'broadcasting' species release their male and female gametes into the water column where they are fertilised; the developing pelagic larvae are dispersed by currents over many kilometres until ready to settle some days later. Second, 'brooding' species have their eggs fertilised within the mother colony; in these cases the resulting larvae develop on the colony surface until they are ready to detach and settle near the mother colony some days later. The food of octocorals consists of small suspended plankton particles filtered from the water column; they rely on water currents to carry the particles towards their polyps. Actively swimming zooplankton is not ingested as the stinging cells are only weakly developed and unable to paralyse large zooplankton items. Much of the food is therefore derived from phytoplankton, minute detrital particles, flagellates and very small zooplankton. More than half of the warm shallow-water Indo-Pacific octocorals also contain endosymbiotic dinoflagellate algae (often called zooxanthellae) in their tissue, which fix carbon through photosynthesis and hence supply energy to their host. The coral in return provides nutrients and shelter to the algae. This finely tuned symbiosis between animal and alga depends on the availability of light for photosynthesis. Symbiotic taxa (also called zooxanthellate or phototrophic taxa) include many representatives within the 'true' soft corals (the Alcyoniina group), especially many of the genera within the abundant families Nephtheidae, Alcyoniidae and Xeniidae, but also members of most of the other large octocoral groupings. In contrast, most sea fans, and also several of the soft corals (e.g. Dendronephthya) do not contain dinoflagellate endo-symbionts. These asymbiotic (azooxanthellate or het-erotrophic) taxa are suspension feeders that strongly depend on currents to transport food particles towards the polyps; they are mostly found in high-flow environments. Heterotrophic taxa are easily visually distinguished from their phototrophic relatives by their bright yellow, orange, red, pink, purple or snow-white colouration. As sessile organisms without a protective skeleton, octocorals would appear to be vulnerable to predation. However, with the exception of a few snails (e.g. the cowry shell Ovula ovum), fish (e.g. a few species of butterfly fish that selectively feed on coral and octocoral polyps) and the odd or accidental grazing by an echin-oderm such as Diadema sea urchins, remarkably few organisms are able to feed on octocorals, and overall feeding pressure appears low. Many species are protected against predation, fouling by algae or overgrowth by neighbouring organisms through feeding-deterrent, toxic or allelopathic secondary metabolites. Many of these substances have been investigated for their bioactivity, and some may one day become phar-maceutically relevant. Octocoral colonies, although not contributing to reef growth, nevertheless provide shelter to a range of other reef-inhabiting organisms. For example, some species of brittle star (Ophiuroidae), feather star (Crinoidea), shrimps, ctenophores and fish (gobies and pygmy sea horses) are exclusively found living on the surface of specific octocoral colonies. Most of these associates use the octocoral colony exclusively as a perch or for shelter; however, a few of these associates appear to also feed on the mucus of the octocorals. After hard corals, octocorals are the second-most common group of macrobenthic animals on the GBR. Mean octocoral cover of the GBR regions ranges from 3% to 35% on outer reef slopes, but cover can be as high as 70% in current-swept yet wave-protected environments such as channels between reefs or islands, and near zero on wave-exposed macro-algal dominated turbid and silty inshore reef crests. 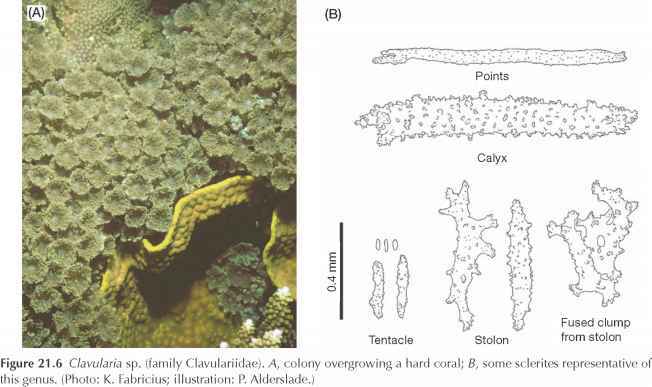 Octocorals are highly diverse, not only taxonomi-cally, but also ecologically, including species with widely contrasting ecological niches and life history strategies. The GBR is situated on a wide continental shelf, and due to this geomorphologic setting contains a remarkable range of marine habitats. Habitats for oc-tocorals in the GBR include wave-beaten outer barrier reef walls with steep drop-offs and oceanic water clarity, more protected midshelf reefs with sheltered lagoons and current-flushed flanks, extensive inter-reefal areas with soft bottom environments and outcrops of hard substratum, seagrass meadows and Halimeda mounds, and inshore coral reefs within the reach of terrestrial influences. Each of these habitat types houses a distinct octocoral assemblage. For example, outer-shelf reefs contain diverse octocoral communities that are often characterised by high abundances of members of the family Xeniidae. Midshelf reefs have the highest species richness of all reefs on the GBR. Deep-water reef slopes and inter-reefal habitats are inhabited by azooxanthellate taxa such as many gorgo-nians and Dendronephthya, as well as ubiquitous and tolerant taxa such as Sinularia and Sarcophyton. Inshore reefs with fluctuating salinity and water clarity contain some species that are rarely found in clear-water habitats (e.g. Sinularia flexibilis, and several species of Briareum and Solenocaulon), as well as a subset of those genera found in the clear-water habitats. Many of the Xeniidae and Nephtheidae are missing on turbid inshore reefs. Ecological surveys have shown that the taxonomic richness of octocorals is strongly related to water clarity and amounts of sediments deposited, and that richness and the abundance of specific taxa are therefore more suitable indicators of change in environmental conditions than are hard coral cover, octocoral cover and hard coral richness, which are poorly explained by these variables. Changes in taxonomic richness and community composition in octocorals have therefore been suggested to be suitable as indicators of past and recent disturbance by poor water quality on the GBR and other reef environments. Species richness at a given site is affected by three factors. First, the biogeographic location and colonisation history of a region determines the regional species pool present. On the GBR, the species richness in octocorals strongly attenuates with increasing latitude: many more genera and species occur in the tropical far northern part than on the southern end of the GBR. Second, environmental conditions determine what cross-section of the local species pool occurs at that locality. In octocorals, abundances of particular taxa are strongly determined by the physical environment, especially turbidity, light availability and water currents. Third, at any point in time local and regional species richness also depend on disturbance history, specifically the nature and intensity of the disturbance, and the time since past disturbances have removed colonies. For octocorals, disturbances include storms with high wave energy (dislodging or damaging colonies), episodes of high water temperatures (causing coral bleaching), chronically reduced water clarity (reducing photosynthesis) and sedimentation (smothering colonies or hampering larval settlement). After a disturbance, the speed and efficiency of recolonisation of a taxon will determine whether the taxon will again be present or not: fast colonisers continuously reestablish if propagules from surviving colonies (locally or further upstream) are available, whereas slow-colonising or slow-growing taxa are unable to quickly return to their previous abundance. Similarly, chronic disturbance such as water pollution reduces diversity, because only persistent species can survive and flourish. In order to understand regional and local biodiversity patterns, biogeographic settings, environmental requirements of taxa, and consequences of disturbances need to be investigated simultaneously. The identification of octocorals is based primarily on colony form, the nature, location and arrangement of the sclerites and the nature of the central axis if one is present. (See Box 21.1 for collection and preservation methods.) Octocorals are modular animals that, except in rare occurrences, are constructed of a number of polyps united in a common tissue mass called the coenen-chyme. The growth form of a colony may be stolonate, membranous, encrusting, fleshy, erect, and either whiplike or branching (Fig. 21.2). In some species, a central axis is present (Fig. 21.3). If such an axis contains sclerites, the coenenchyme is divided into an outer cortex, which includes the polyps, and an inner axial medulla. The medulla may be continuous or segmented, but always contains densely grouped sclerites that can be free or may be fused to various degrees and combined with gorgonin, a horn-like material. Most gorgo-nians, however, have an axis that does not include sclerites. In this case, the outer layer with the polyps is just called the coenenchyme, and the inner layer is simply called the axis that may be continuous or segmented, and is often made of gorgonin with or without the inclusion of various amounts of fibrous calcium carbonate. Two types of polyps are found in octocorals. The first type, autozooids, are generally responsible for feeding and reproduction, and are present in all species. Autozooids always have eight tentacles that, except in a few cases, bear pinnules along each edge. The second type of polyp, called a siphonozooid, is primarily for water circulation, and is found in representatives of several families. Siphonozooids are very small, and have rudimentary or no tentacles. Taxa that have both polyp types are referred to as dimorphic (e.g. the Lobophytum).